This 1962 movie was among the last of the old-fashioned “epic” films that was released by Metro-Goldwyn-Mayer (MGM). Filmed using the Cinerama widescreen process, it featured an all-star cast directed by at least three directors. After making the decision to use the Cinerama wide-screen process, MGM decided to produce a cinematic adaptation ofLIFE magazine’s 1959 series of articles about the history of the American West. Screenwriters James R. Webb and John Gay (uncredited) achieved this by focusing the film on two to three generations of family that migrated westward from western New York, to Southern Ohio, to California and finally to the deserts of Arizona. The story stretched out in a period of fifty (50) years from the late 1830s to the late 1880s. 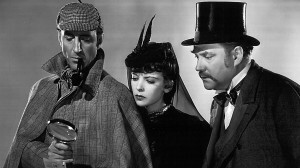 According to Wikipedia, the movie was set between 1839 and 1889. Yet, Webb and Gay’s script never indicated this. The movie consisted of five segments that were directed by three directors, Henry Hathaway, John Ford and George Marshall. “The Rivers”, which was directed by Henry Hathaway, focused on the Prescott family’s journey from western New York to Southern Ohio, in an attempt to reach the Illinois country via the Erie Canal and the Ohio River. During their journey, they meet a mountain man named Linus Rawlins, who falls in love with eldest daughter, Eve; encounter murderous river pirates; and are caught in some dangerous rapids during their trip down the Ohio River. The last part of their journey ends in Southern Ohio, when the patriarch and matriarch of the Prescotts are drowned and Eve decides to remain there. She eventually marries Linus and her younger sister, Lilith decides to head to St. Louis. In “The Plains”, Lilith Prescott is a dance hall entertainer in St. Louis, when she receives news of an inheritance – a California gold mine – from a former patron. In order to join a California-bound wagon train, Lilith becomes the traveling companion of a middle-aged woman named Agatha Clegg. She also becomes the romantic object of two men – the hard-nosed wagonmaster Roger Morgan (who has a ranch in California) and a professional gambler named Cleve Van Valen. Lilith eventually forms an attachment to Cleve. But when her inheritance turns out to be a bust upon their arrival in California, Cleve abandons her. He eventually reconciles with her on a Sacramento River steamboat and the two marry. Hathaway also directed. John Ford directed “The Civil War”, a short segment about the experiences of Zeb Rawlins’ (Eve and Linus’ elder son) at the Battle of Shiloh during the Civil War. Although Zeb survives, his father was killed during the battle, and his mother died before his return to the family’s Ohio farm. Zeb decides to remain in the Army after the war. “The Railroad” was about Zeb’s experiences as an Army officer during the construction of the railroad during the late 1860s. He tries and fails to keep the peace between the construction crew led by a man named Mike King and the local Arapaho tribe. The Arapho incites a buffalo stampede through the railroad camp after King breaks another promise. And Zeb resigns from the Army. George Marshall directed. 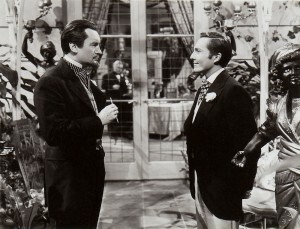 Hathaway directed the final segment, “The Outlaws”, which featured Zeb’s last days as a law officer, as he tries to prevent a group of outlaws led by a man named Charlie Gant from stealing a shipment of gold. After he is successful, Zeb and his family join his widowed aunt Lilith on a trip to her new Arizona ranch. 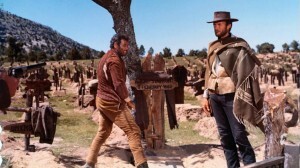 “HOW THE WEST WAS WON” was nominated for eight Academy Awards, including Best Picture. It won three won – Best Screenplay, Best Film Editing and Best Sound. It is also considered a favorite of director Ron Howard. I might as well be honest. I have always liked “HOW THE WEST WAS WON”. If I had not, I would have never purchased the DVD set. But I cannot see how it was ever nominated for Best Picture, let alone won the Best Screenplay Oscar. It was NOT that great. To me, “HOW THE WEST WAS WON” was a mediocre epic that featured a small handful of excellent performances, great photography and a superb score. The fifty year period that spanned “HOW THE WEST WAS WON” struck me as more suitable for a television miniseries, instead of a movie – even if it had a running time of 162 minutes. 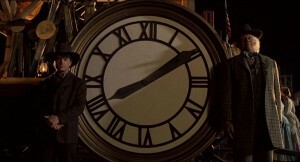 There was too much going on in this film and its time span of fifty years was simply too long. 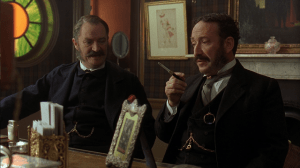 The 2005 miniseries, “INTO THE WEST” had a similar premise, but it had the good luck to be aired in a six-part miniseries that ran for 552 minutes. And because of the lack of balance between the story’s premise/time span and its running time, the story about the Prescott-Rawlins family seemed half-empty . . . and rushed. 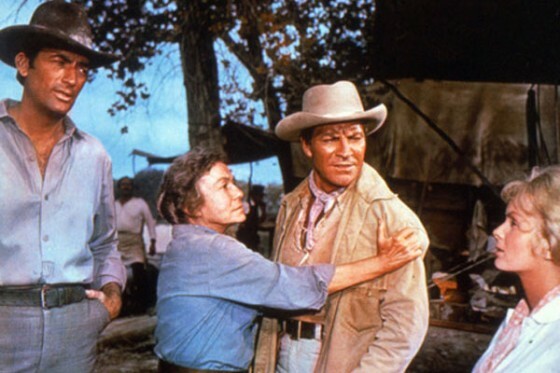 The best of the five segments are the first two directed by Henry Hathaway – “The River” and “The Plains”, which featured the Prescotts treks from New York, to Ohio. Although not perfect, thanks to some plot inconsistency and historical inaccuracy. What makes these two segments superior to the other three is that are longer and if I must be frank, more substantial. I could not decide between the two segments on which was my favorite. I enjoyed viewing the family’s journey down the Ohio River and the exciting battle with the river pirates. On the other hand, both Debbie Reynolds and Gregory Peck’s performances made “The Plains” very enjoyable for me. 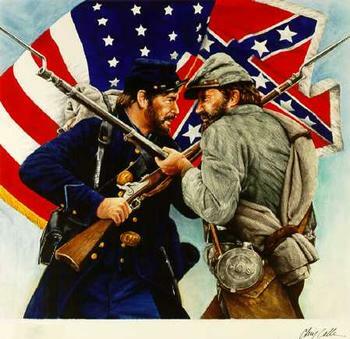 But the worst of the three segments is the third one directed by John Ford – namely “The Civil War”. I hate to say this, but John Wayne did not make an effective William T. Sherman. The recently deceased Henry Morgan did a slightly better job as Ulysses S. Grant – frankly, by saying as little as possible. 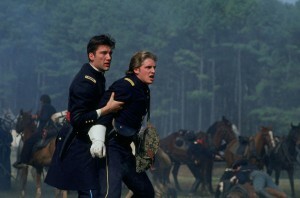 As for the segment, the screenwriters and Ford did not even bother to feature any plausible battle scenes of Shiloh. Instead, the audience was subjected to a quick montage of Civil War scenes from other MGM movies – probably 1957’s “RAINTREE COUNTRY”. The only good thing about this segment was the beginning scene, when Zeb said good-bye to his mother and younger brother . . . and the last scene, when he said good-bye and handed over his share of the family farm to his brother. 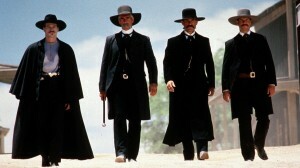 I enjoyed the work of the cinematography team led by the legendary William H. Daniels very much. I noticed that a great deal of the movie was shot on location in many of the national parks in the United States. However, the Cinerama process took away some of the grandeur with the curved lens, which made it impossible for Daniels and the others to film any effective close ups. And has anyone ever notice that whenever two of the actors seemed to facing each other, their lines of sight seemed to be slightly off? It must have been hell for the actors to face off each other in a scene, while being unnaturally positioned for the camera. There were certain aspects of “HOW THE WEST WAS WON” that made it enjoyable for me. 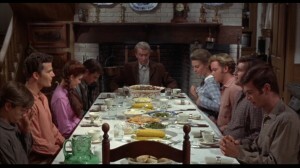 Debbie Reynolds, Carroll Baker, George Peppard, Gregory Peck, Thelma Ritter, Henry Fonda, Lee J.Cobb and Eli Wallach gave the best performances, as far as I am concerned. Spencer Tracy did a top-notch job as the film’s narrator. But I especially have to commend Reynolds, Baker and Peppard for damn near carrying this film. 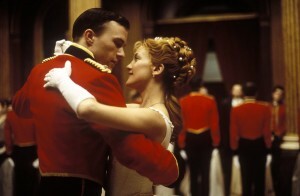 Without them, this movie would have folded like a sheet of paper. There were some performances that did not ring true to me. According to one scene that featured Linus Rawlings’ grave, Eve’s husband and Zeb’s father was born in 1810. I hate to say this, but James Stewart was too old – at the age of 53 or 54 – to be portraying a 29 year-old man. He gave an entertaining performance, but he was too damn old. Karl Malden, who portrayed Eve and Lilith’s father, struck me as a bit too hammy for my tastes. So were Robert Preston, who portrayed the gauche wagonmaster Roger Morgan; and Richard Widmark, who portrayed the railroad boss Mike King. Everyone else was . . . okay. What was the best thing about “HOW THE WEST WAS WON”? The music. Period. It . . . was . . . superb. Every time I hear the first notes of Alfred Newman’s score at the beginning of the movie, I feel goosebumps. I love it that much. As much as I enjoyed John Addison’s score for “TOM JONES”, I find it mind boggling that it beat out Newman’s score for“HOW THE WEST WAS WON”. I just cannot conceive this. 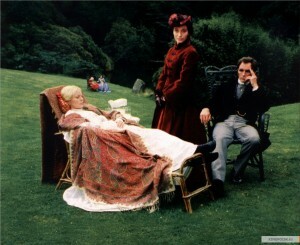 Newman also provided 19th century music from the era for the movie and it was used beautifully . . . especially in “The Plains” segment. With Reynolds portraying a dance hall performer, she provided moviegoers with entertaining renditions of songs like “What Was Your Name in the East?”, “Raise a Ruckus” and the movie’s theme song, “Home in the Meadows”. What else can I say about “HOW THE WEST WAS WON”? It is an entertaining movie. I cannot deny this. It featured first rate performances by the leads Debbie Reynolds, Carroll Baker and George Peppard. It featured beautiful photography shot by a team of cinematographers led by William Daniels. And it featured some gorgeous music, which included a superb score written by Alfred Newman. But it is a flawed movie tainted by historical inaccuracy and a story that would have been served best in a television miniseries. I am still astounded that it managed to earn a Best Picture Academy Award. 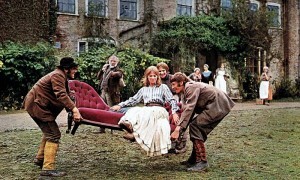 The sprawling 1962 movie, “HOW THE WEST WAS WON” focused upon the fifty (50) years history of the Prescott-Rawlins family between 1839 and 1889. 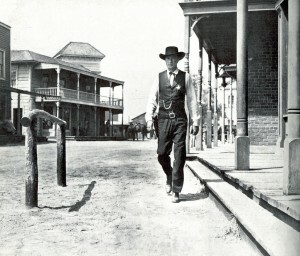 The movie was divided into five sections – “The Rivers”, “The Plains”, “The Civil War”, “The Railroad” and “The Outlaws”. 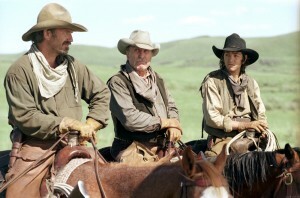 Westbound migration was featured in the movie’s first two segments – “The River” and “The Plains”. “HOW THE WEST WAS WON” opens in 1839 (I think) with the Prescotts, a family from upstate New York, westbound to settle on new land in Illinois. After a trip along the Erie Canal, the Prescotts and their traveling companions, the Harveys from Scotland, build flatboats for the westbound journey on the Ohio River. During their journey, they meet a mountain man named Linus Rawlins (James Stewart), who is eastbound to sell his furs in Pittsburgh. The Prescotts’ oldest daughter, Eve (Carroll Baker), and Linus fall in love. After a disastrous encounter with river rapids that led to the deaths of Mr. and Mrs. Prescott; Eve decides to settle at the very location of their deaths in Southern Ohio and accept Linus’ marriage proposal. Younger sister Lilith Prescott (Debbie Reynolds) decides to move on. “The Plains” picks up over a decade later, with Lilith as a dance hall performer in St. Louis. She learns from an attorney that she has inherited a California gold claim from a now deceased customer. Lilith travels to Independence, where she joins a California-bound wagon train by becoming the traveling companion of a middle-aged woman named Aggie Clegg (Thelma Ritter), willing to use Lilith’s looks to attract eligible men for marriage. Lilith also attracts the attention of two men, wagonmaster Roger Morgan (Robert Preston) and a roguish gambler named Cleve Van Valen (Gregory Peck). To this day, I never understood why screenwriter James R. Webb allowed the Prescotts and the Harveys to travel across the Erie Canal. It is obvious that he had every intention of having them settle in Southern Ohio, along the River. So why use that route? According to a 1840 map I had seen, the Erie Canal was a waterway that stretched from Albany to Buffalo in upstate New York. This meant that the Prescotts and Harveys’s first leg of their journey ended at Buffalo, along the shores of Lake Erie. Are we really supposed to believe that the two families then journeyed from Buffalo to the banks of the Ohio River, in order to reach Illinois, when they could have easily traveled near the U.S.-Canada border to reach their destination? 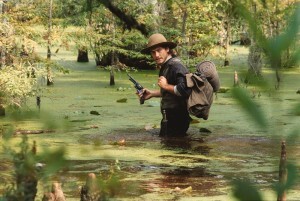 And Webb failed to reveal how they reached the Ohio River without a wagon. He could have allowed Eve Prescott and the other surviving members of the family to settle in Illinois or Ohio near one of the Great Lakes . . . or avoid the Erie Canal altogether and end up in Southern Ohio. Unfortunately, the screenwriter settled for a convoluted route. Even worse, he had mountain man Linus Rawlins traveling toward Pittsburgh to sell furs. Really? In 1839? Linus could have easily sold his furs further west in St. Louis or more importantly, Independence in western Missouri, without having to cross the Mississippi River. When Lilith Prescott traveled to California after inheriting her California gold claim over a decade later, she chose the correct route – the Oregon/California Trails. However, Webb, director Henry Hathaway, and the producers decide to include nearly every cliché regarding western migration. One, gambler Cleve Van Valen tried to join Roger Morgan’s wagon train in Independence, in order to make acquaintance with Lilith. He was told to get lost. Cleve managed to catch up with the wagon train some 100 miles west of Independence. Yet, the terrain looked suspiciously arid for eastern Kansas. The wagon trains used in this production were very large. In fact, they struck me as looking larger than a typical Conestoga wagon. 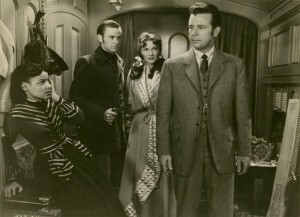 One scene in the movie featured Cleve and a group of male emigrants playing poker inside one wagon . . . while it was traveling. This was Hollywood history at its worse. And guess what? Those wagons were pulled by horses, not oxen or mules. “HOW THE WEST WAS WON” never featured any well known landmarks along the Oregon/California Trails. I suspect this was due to the movie’s constraining time for each segment. However, there was time to feature a large scale attack on the wagon train by a horde of Cheyenne warriors. And this attack was made against a large and well-armed wagon train. In reality, there would have never been such an attack in the first place. And if such a thing had happened, the Cheyenne would have been seriously wiped out. I cannot deny that “HOW THE WEST WAS WON” was an entertaining film. But in the end, it turned out to be too much “Hollywood” and not enough “History”.